VRadio | Listen to your favorite stations like never before! Listen to your favorite radio stations like never before! Enjoy a unique user interface that is compact and easy to use. Find the stations you are looking for in only a few seconds. Great variety of stations from many countries and locations around the world. That's right! No hidden fees or purchases. Everything is available for everyone for free. 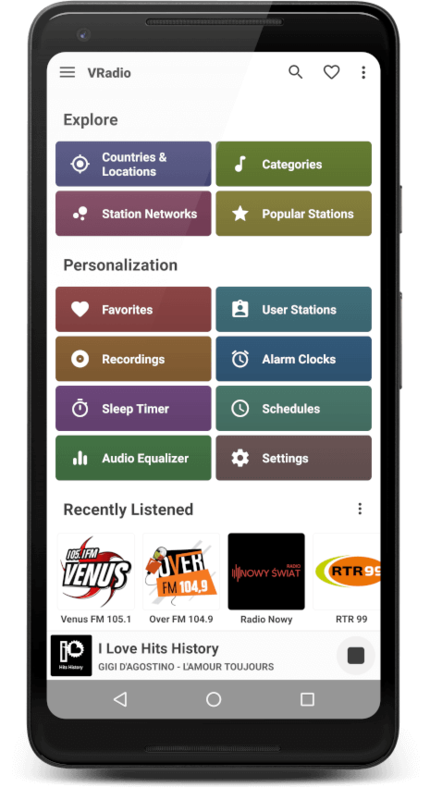 *Android Only* Listen to your favorite radio stations on your television or speakers using your device as a remote control. Discover what most of the users prefer to listen on VRadio. Find out which song is playing on the station you are listening to and look for it on YouTube.